On Thursday, May 14, at 11 a.m. in the Campus Center, the University hosted an environmentally-friendly ceremony to mark the first midsize wind turbine to be installed on a Maine university campus. State and local dignitaries – including UMPI President Don Zillman; Sumul Shah, President of Lumus Construction, Inc.; Commissioner Vendean Vafiades of the Maine Public Utilities Commission; University of Maine System Chancellor Richard Pattenaude; representatives of Maine’s Congressional Delegation; and Presque Isle City Manager Tom Stevens – gathered with campus and community members for the ceremonial commissioning of the University’s 600 kW wind turbine. The first half of the event, at the Campus Center, included remarks by local and state officials as well as a short presentation on how the University’s wind turbine would transform wind into electricity and how that electricity would be delivered to the campus buildings it would power. 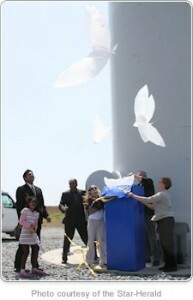 The second half of the event, at the wind turbine site, included a Native American drumming song and a ribbon cutting featuring the release of environmentally-friendly, dove-shaped, paper balloons (similar balloons were released during the 1998 Winter Olympics in Nagano, Japan). The ceremonial commissioning also featured the release of more than 100 small, paper whirligigs from the top of the turbine tower. Refreshments and videos showcasing UMPI’s wind turbine installation were available inside the Campus Center following the ceremony.